The time is now for red, white, and blue strawberries. 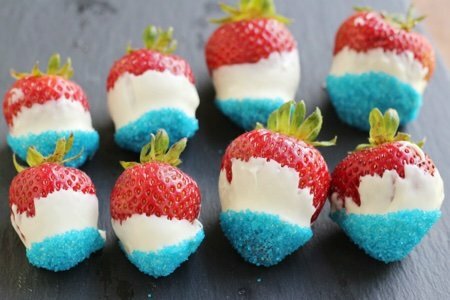 Not only is July Fourth right around the corner but you don’t have to cook anything to make these. 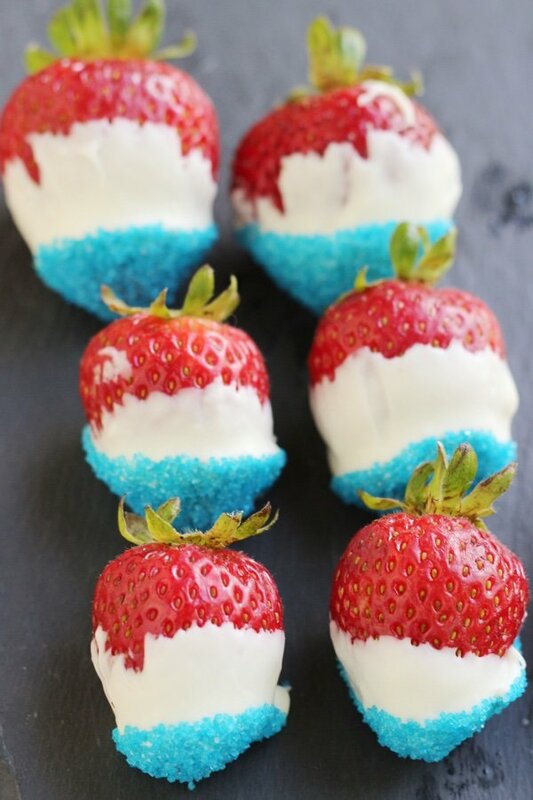 I believe these are the perfect patriotic treat. Of course, you can do some fruitskewers or strawberries stuffed with sweetened cream cheese topped with a blueberry and not use your kitchen. 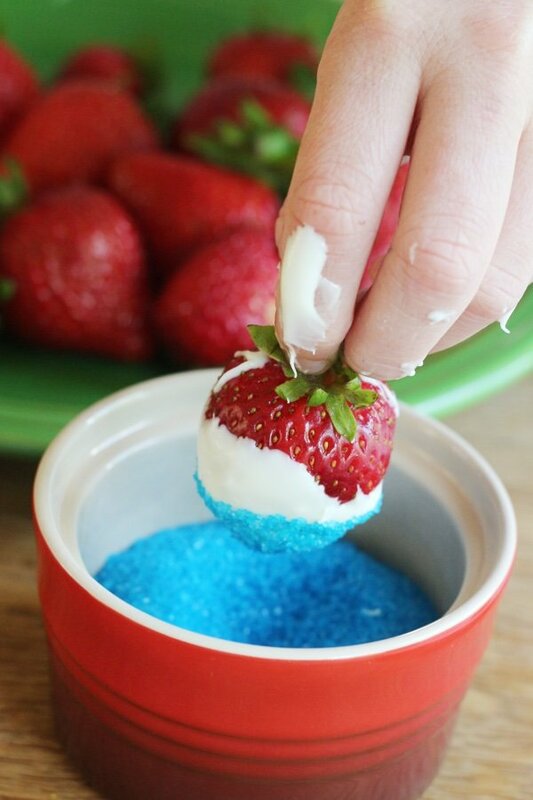 These patriotic strawberries only use three ingredients and take mere minutes to make. Strawberries, blue sugar, and white morsels combine to make this fun dessert. White morsels used be called “white chocolate” until the FDA decided that to be called white chocolate the candy must have at least 20% cocoa butter, 14% milk solds, and 3.5% milk fat. My $2 bag of white morsels does not fit the bill. Does it matter? No, because it still tastes pretty good. My 12 year old daughter and I made these together and as you can see she dipped more than the strawberries into the white morsels. We had a lot of fun attempting to make the perfect strawberry and she kept eating the mistakes. After a while, I began to think she was messing up on purpose! The sweetness of the morsels is a delicious contrast to the strawberry. Also, there is a little crunch that happens because of the sugar. Sweet, crunchy, soft, sour, fruity…..aaah! Bring these to a BBQ or don’t share them at all. Eat them, slowly, one at a time, and feel grateful for summer and all the tasty strawberries that show up. For me the combination of sun and strawberries is pure heaven. I also love how these are a clear portion size and you will be aware of how many you eat because you leave the beautiful green leaves still attached. If your plate fills with these, you know you have to share with your family a wee bit more. Line a baking sheet with parchment paper or waxed paper. Heat white morsels in a small cup in the microwave for 20 seconds at a time until melted and smooth. 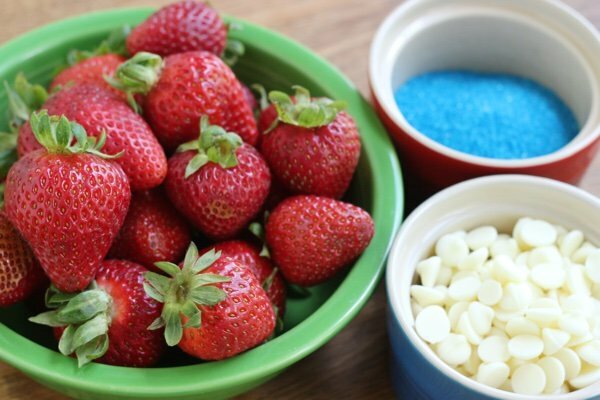 Dip strawberries one at a time in morsels and then sugar creating a three colored berry. Place on parchment paper and allow to harden (about 10 minutes). Store in the refrigerator in a sealed container or serve immediately. Cute dessert! I am not an American but will use these colours as a tribute to a great country - my neighbours to the south. Happy 4th of July! These look real cute. Wait, 66 calories each? A strawberry is 4 calories so 62 calories from artificial sugar? Yikes that's over 4 tsp sugar per berry! Maybe you calculated in error. I would do over the color scheme idea by returning to skewers--the shorter ones--1 strawberry, 1 mini-marshmallow and 1 or 2 blueberries. Under 10 calories, sweet and cute. Ok not as cute as yours. :) Other 4th ideas: Add red, white and blue to the table by stacking up salad plates in those colors or using other table decor, bows, candles, etc. I'm focusing on healthy delicious whole foods. Sorry, no offense to you, Lisa, or anyone else, just trying to cut sugar where possible. I love your blog and all your ideas and inspirations!. Happy Healthy 4th! Snack Girl is that you? This doesn't sound like you! Really surprised to see this post. @BarbL - each strawberry has about 8 grams of added sugar - which is about 1.5 teaspoons. I wasn't arguing that these were healthy - they are a simple treat. You can look at this in a couple different ways - one is that at least you get a little fresh fruit with your sugar. Better than an Oreo? perhaps. I was having some fun! For the 4th of July, we were served huge slabs of apple pie. These are certainly a cuter and better option. A little sugar on a berry for the holiday? Absolutely! Yes, you were having some fun. Fun is important. Ignore the detractors, Lisa. This is a festive, beautiful and tasty dessert. You still get the nutrition the fresh fruit provides, and we all like a treat once in a while. Life would be very dull if all we had to eat was oat bran and lean protein and that was it.